It’s The East Coast Fever. Again. Kelantan Delights – Almost religiously, we stopped talking; stopped yapping about the previous meals each of us had, the new places in town, and the misfortune of dining in peculiar eateries sprouting up all over Klang Valley. 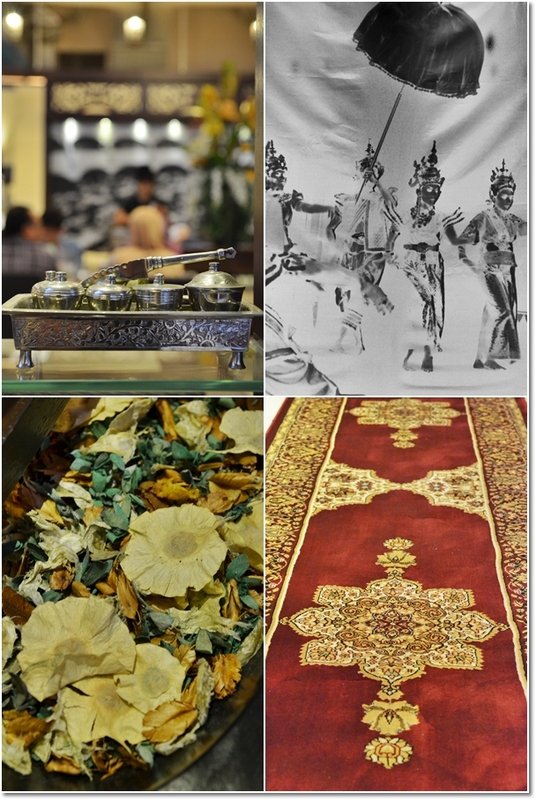 The attention was shifted indefinitely; channeled towards the aesthetically-plated servings of Kelantanese/Malay delights. Slightly more than two years ago, I left my tracks on Kelantan’s soils. It was more than a working trip. It was …. a holiday well-deserved. Yes, that terrifying thought of waking up every weekend in different states of Malaysia. But back then, nothing was overwhelming like it is now. Every single opportunity to get out of the office was much appreciated. A battalion of us marching (or rather, driving) to the east coast for a good 4 days or so. The excursion took our breath away …. more so because of the hectic schedule and hours on the road, than the scenery that embraced the city child in us. But, we were not complaining. On the contrary, I started missing Kota Bharu almost immediately after the trip. When things set in and there I was anticipating for the next runaway to the east coast for work, a course or joint activities with our counterparts over in the eastern states of peninsular Malaysia. But my wish never materialized. It would be a sin to forgo the opportunity for a Kodak moment here; with interior designing worthy of an accolade and then some. 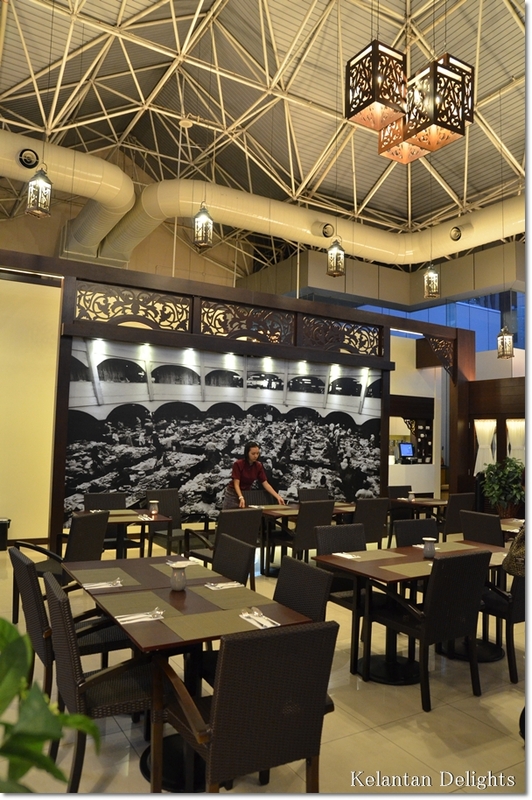 This could be THE place to hold a function that calls for Halal cuisine. Thus, I started craving for another bite of ‘akok‘, that famous Kelantanese dessert/snack that looked nothing like an elegant piece of a signature ‘kueh’. YET, the proof is in the pudding as they said. And this piece of wrinkled block of sweet delight made from an overdose of eggs captured my heart almost instantly. But …. aside from the ones I found at Pasar Siti Khadijah in Kelantan, where can I savour the same sensation here in the city? I saw Kelantan Delights back when they set up an elaborate al fresco dining tent to usher in the Raya celebration during the fasting month of Aug-Sept. Here I was wondering what’s the big fuss about this new restaurant specializing in cuisines from the East Coast; highly patronized by the breaking fast crowd in the evenings, and relatively vacant at other times. Nasi Kerabu with Daging; a Kelantanese specialty with blue-tainted rice (colourant from natural flowers named ‘bunga telang’), half a salted egg, a spicy-sweetish coconut milk-based gravy resembling rendang, slices of lean beef grilled to a jerky-like texture, and the pile of raw vegetables. Ikan Siakap cooked in a variety of ways; we sampled two varieties of them – with Serai (lemongrass) and with Kodok (betel leaves), the other savoury mains we sampled were the Belut (eel) stir-fried with dried chillies and the Puyoh (quail) fried with condiments of dried chillies and long beans. Laksam; steamed rice rolls in an extremely milky broth laden with coconut milk (Santan), and with a heavy, briny nuance from the fish used in the gravy. A little too cloying for me, but would do good if you’re eating this as it is without any sides. Nasi Kerabu, Nasi Dagang and Nasi Tumpang are but some of the more common ones; possibly found in other menus. 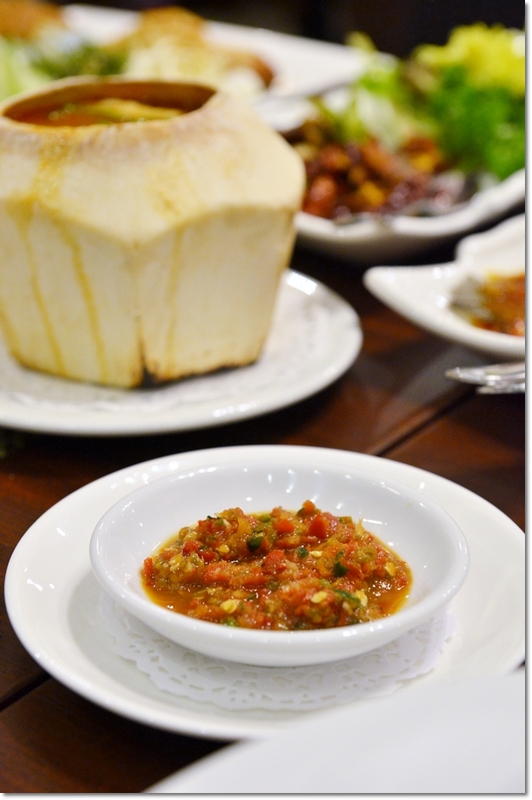 But Nasi Budu on the other hand …. screamed for attention. Budu is essentially a sauce made from fermented anchovies (or sometimes other fish) mixed with a spicy chili paste (sambal) and a squeeze of lime. 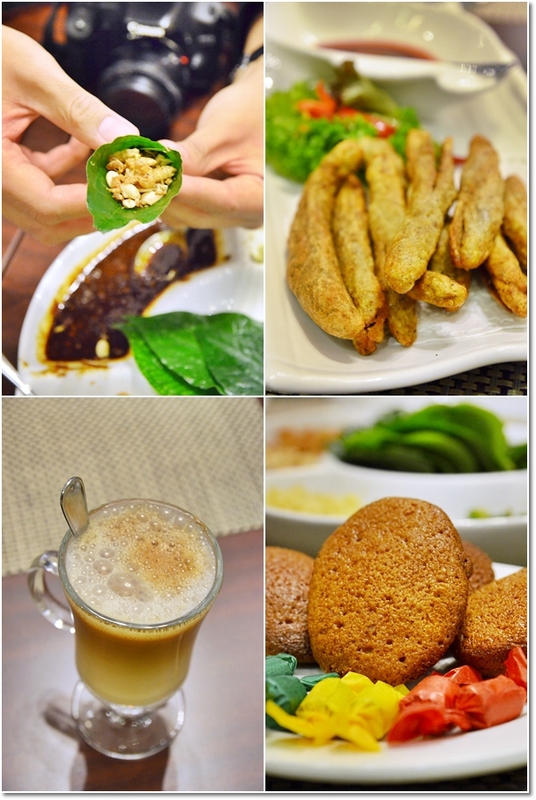 Usually eaten with ulam (raw vegetables) or with fried meats/seafood. And Malaysians being Malaysians, we all need our sambal sometimes. Or, at any one time. 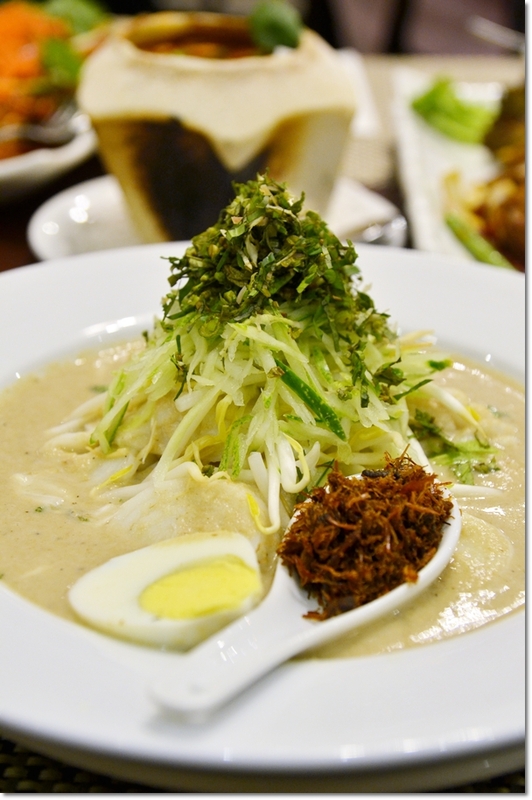 Kelantan Delights may sound new to Subang Jaya. 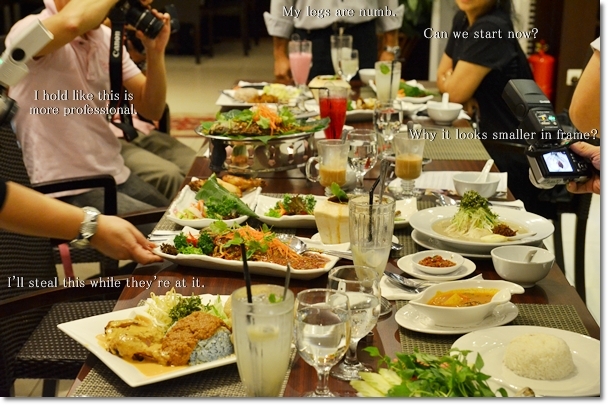 But not to the Malay cuisine loving crowd. They have been around since the first outlet (or maybe, stall) opened in KLCC. Then a second one started in Sooka Sentral. 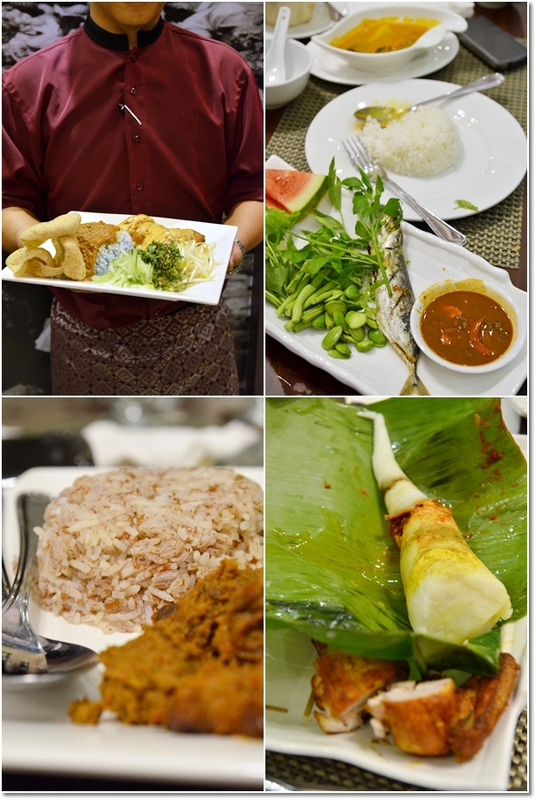 The one in KLCC was closed, and instead the effort to introduce Kelantan cuisine in a proper dining environment was taken to a whole new level at Wisma Consplant in Subang Jaya; wedged between Empire Shopping Gallery and Subang Parade. Kelantanese folks love their desserts. 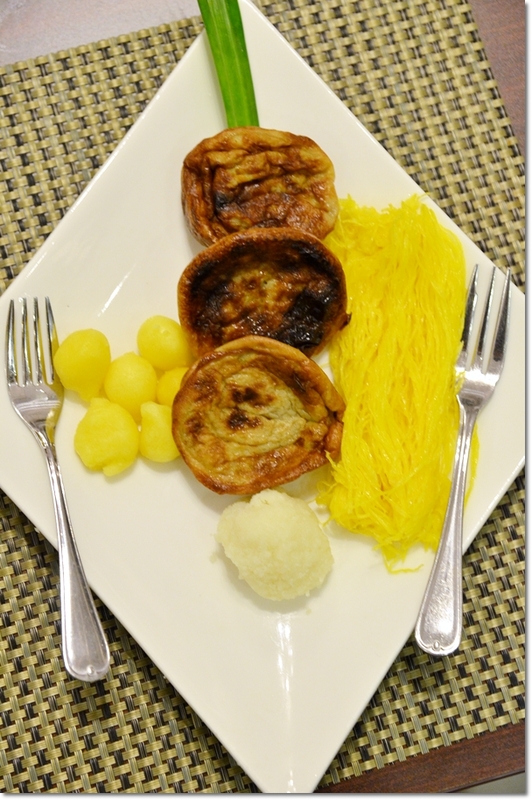 Or any savoury dishes with a touch of sweetness in them. 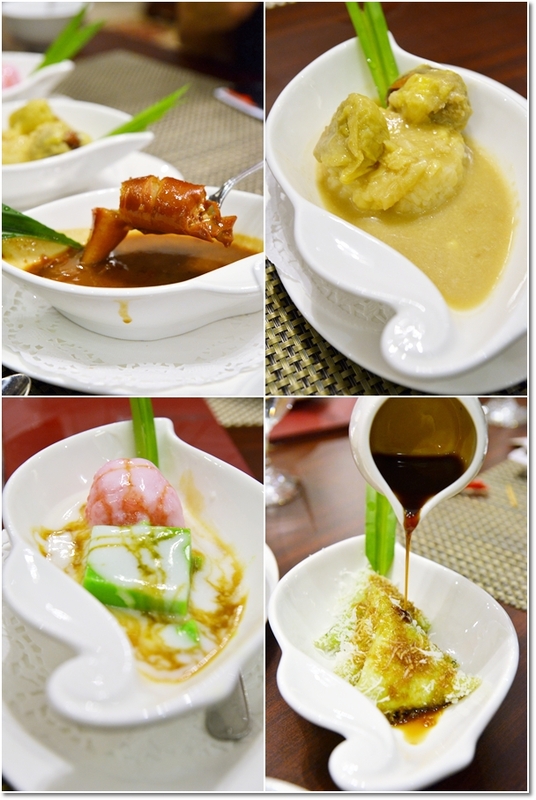 Clockwise from top left : Ketupat Sotong (stuffed squid with glutinous rice in a sweet broth), Pulut Durian, Lopes and Lompat Tikam. 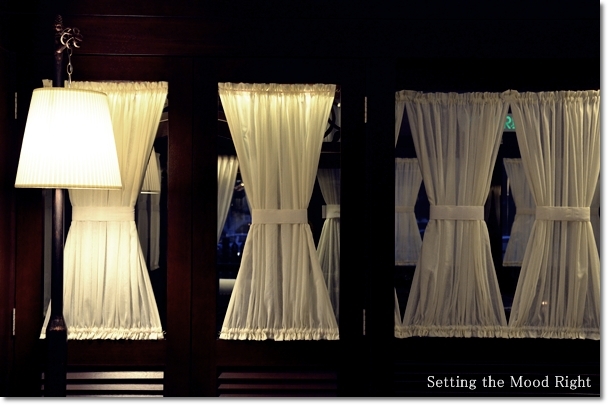 A comfortable setting for a family dinner, business meeting, banquet or function, etc. A plus point? The food’s HALAL and nothing’s too shabby either. 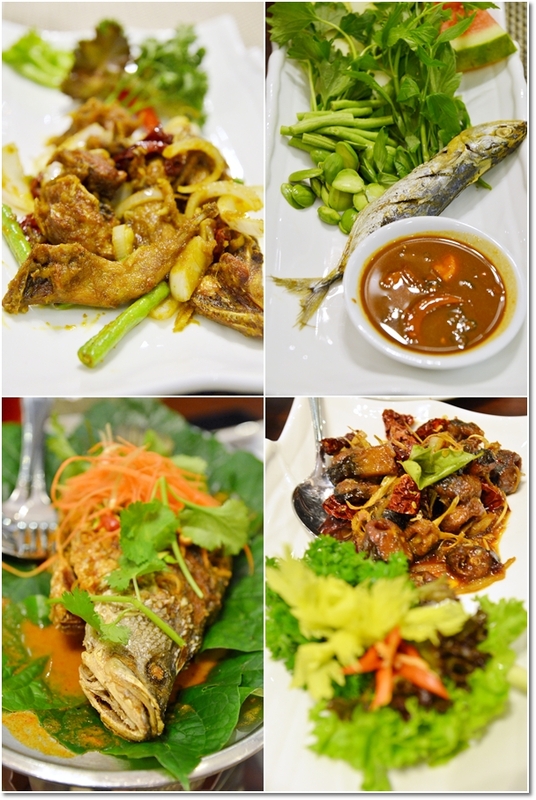 On the whole, the selection of food here borders on the authentic Kelantanese classics to typical Malay dishes. Execution was almost top notch with a kitchen helmed by able hands. (The Aman Rimba experience was a good example of deft, wondrous skills of a cook from Kelantan Delights ‘exported’ for good use). There were minor slip-ups in several of the dishes; but generally noteworthy for the pleasant dining ambience, the strategic location in the heart of Subang Jaya easily accessible from the Federal Highway, and enclosed/segregated dining areas perfect for smaller crowd seeking for a private dining experience. Refer to the map from their official website HERE. *We dined here as guests of Kelantan Delights. Thanks to Chris for extending the invitation. 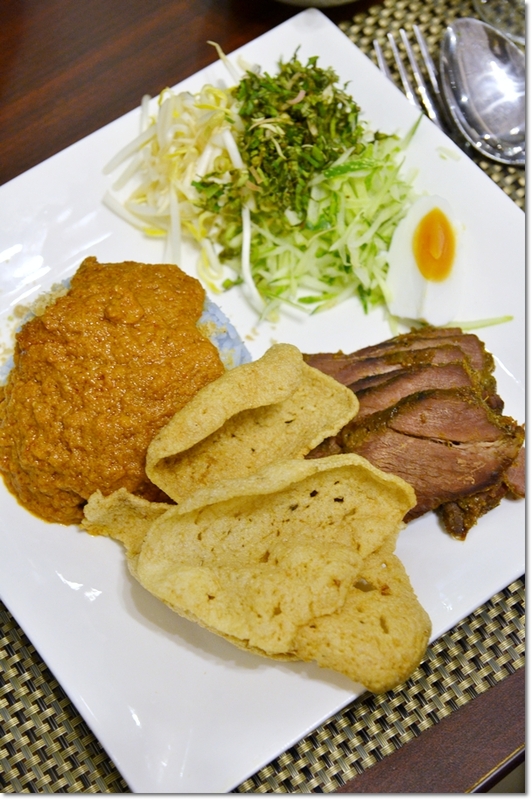 Reckon you may enjoy Anis Putri in Pantai Dalam which does a big serve-yourself lunch with a Kelantanese accent. Special mention to the duck gulai, the gulai kawah, the coriander-heavy beef broth, fried chicken (usually 3 varieties – dara, kampung and biasa), huge variety of ulam and sambal. There’s also nasi dagang at breakfast but no dinner, closed on Friday and a diminished spread on weekends. Excellent prices as well – quite hard to crack RM 7 – 8 ringgit a head. I’ve had to think long and hard before posting this – Anis Putri already does a roaring business and doesn’t really need to get any busier. Not sure about the address but Pantai Dalam has just 1 main road and the restaurant is on it, kind of diagonally opposite the KTM Kommuter station. Great. Haha ….. I can always go and NOT write about it. But highly doubtful if the food’s worth sharing. Thanks Su Sian.